The summer solstice marks the beginning of summer in some areas, while other parts of the world celebrate “midsummer” on the solstice. In 2019, the summer solstice will be at 8:54 AM Pacific, 5:54 Eastern, on Friday, June 21 in Northern Hemisphere. 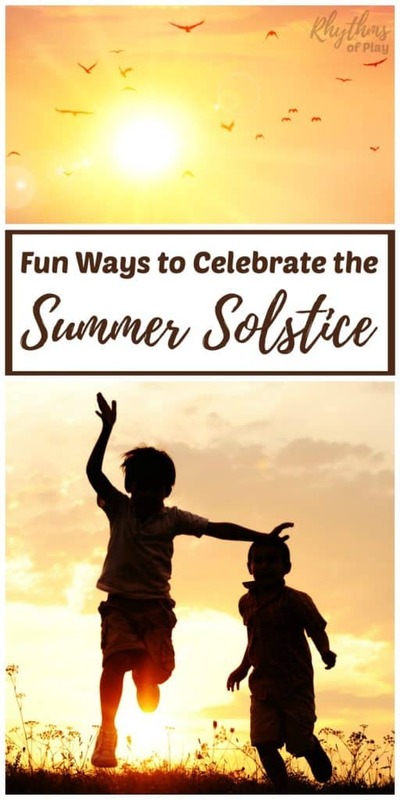 Learn all about the solstice and welcome the summer with these fun summer solstice celebration ideas! There are 2 solstices in every calendar year; one is in June while the other is in December. The time that the solstice occurs is the same across the globe, while the season that you welcome depends on the side of the equator that you live on. The summer solstice usually falls between June 20 and June 22 in the Northern Hemisphere. In the Southern Hemisphere, the summer solstice occurs between December 20 and December 22. On the June Solstice, those in the Northern Hemisphere celebrate the summer solstice, while those in the Southern Hemisphere celebrate the winter solstice. In December these are reversed. In the Northern Hemisphere, the summer solstice usually falls between June 20 and June 22. In the Southern Hemisphere, the summer solstice most often occurs between December 20 and December 22. When is the Summer Solstice in 2019? The summer solstice will occur at 8:54 AM Pacific on Friday, June 21, 2019, in the Northern Hemisphere. On the east coast, the summer solstice will occur on June 21st at 5:54 AM, while the summer solstice will happen at 8:54 AM on the west coast. The summer solstice is the longest day and the shortest night of the year. After the summer solstice occurs, the number of daylight hours will continue to get shorter and shorter until the winter solstice. The reason for this cool fact is a super fun science lesson for kids. It’s all about the tilt of the earth and its rotation around the sun in a single calendar year. 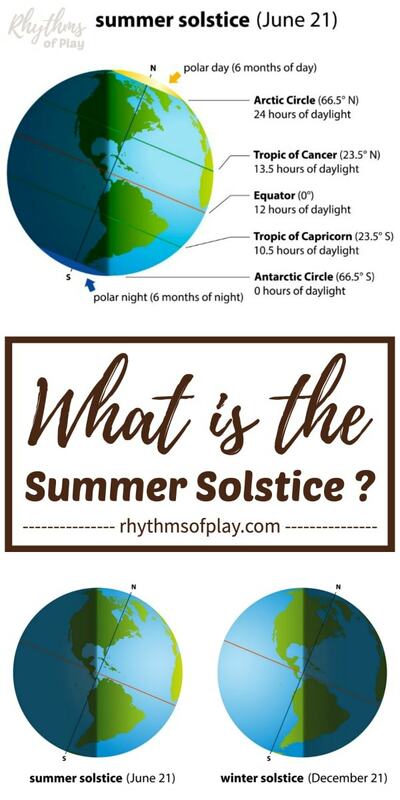 What Causes the Summer Solstice? The summer solstice occurs when Earth’s axis or pole is tilted toward the sun. Planet Earth is tilted at about 23.5 degrees. This means that at different times of the year, either the northern or the southern hemisphere is closer to the sun. When the northern hemisphere is tilted towards the sun the United States and Canada experience the longer warmer days of summer, while those in the southern hemisphere experience the shorter colder days of winter and vice versa. If you live in the Southern Hemisphere and will be welcoming the winter this June, pop over to have a look at our Winter Solstice Celebration Ideas. 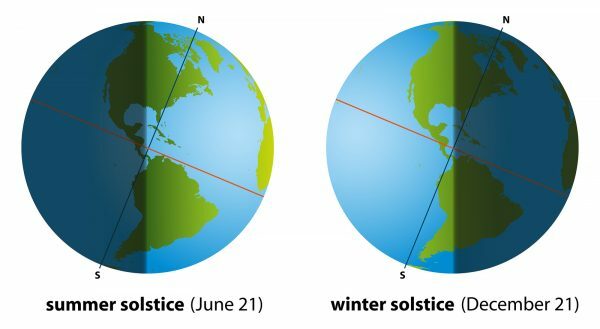 What is the Solstice and the Equinox? The summer solstice marks the longest day of the year. After the summer solstice, the days get shorter and shorter until the shortest day and the longest night of the year is reached on the winter solstice. 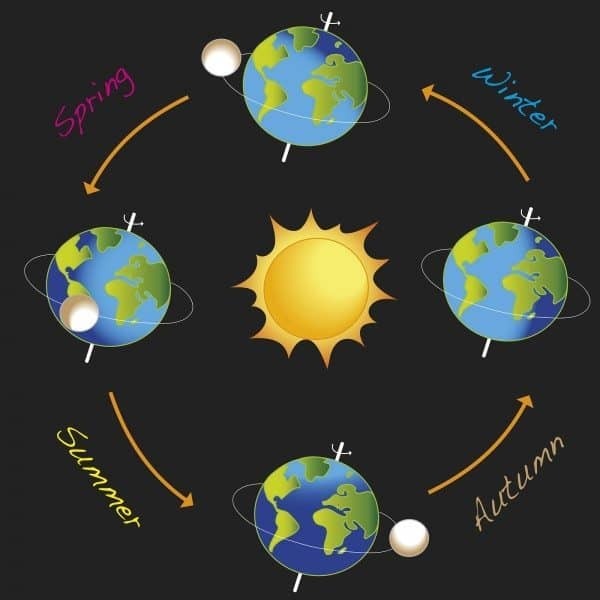 The spring and fall equinoxes occur in between the winter and summer solstices when day and night are said to be equal. Learn more about the spring and fall equinox at the links below! What is the Name of the Longest Day of the Year? The Summer Solstice is the longest day of the year no matter which side of the equator you live on. If you live in the northern hemisphere the longest day of the year will be on or around June 21. In the Southern Hemisphere, the longest day of the year will be on or around December 21. People from many cultures have held solstice celebrations for thousands of years. Traditionally people celebrated renewal, life, fertility, and the potential for a good harvest on the summer solstice. 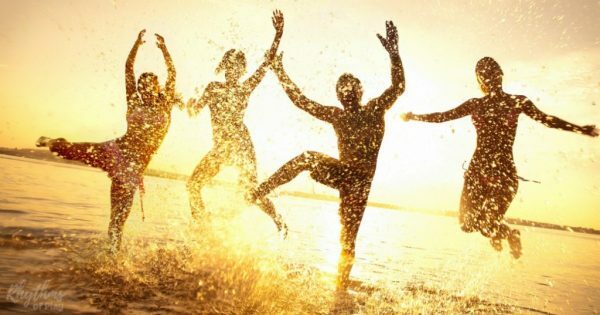 Today people around the world still celebrate the arrival of summer with outdoor feasts, singing, dancing, and bonfires. Make the most of the longest day and the shortest night of the year by celebrating the summer solstice with any of the fun ideas below! For more ideas check out our summer bucket list seasonal activity guide. If you live in the southern hemisphere, hop over to have a look at how to celebrate the winter solstice. Okay, so this is probably not something many of us would be able to do… but there really is no better place to celebrate a solstice! Visit a beach, pool, or park and bathe in the light of the sun for 20-30 minutes. Your own backyard would also be perfect! Be sure to apply chemical-free sunblock so you don’t get burned! 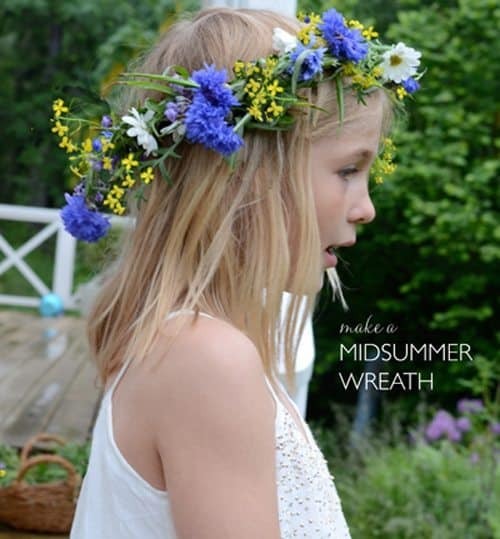 Making a flower crown on the summer solstice is a traditional way to celebrate. Suncatchers make a wonderful craft idea for the summer solstice. We love making suncatchers of all kinds to put in our windows and decorate our home. A suncatcher with a prism will help you capture the suns light to send rainbows all over the house, but the other ideas below are just as much fun! Make some easy sun crafts with your kids for a fun way to celebrate the beginning of summer. Click on the creator of the craft to see the step by step tutorial. Getting out in the garden is a great way to celebrate the summer solstice. Start a garden, bring new life to your garden by planting something new, or just spend some time tending it. Use any of the gardening tutorials below to get started! Creating summer arts, crafts, and activities is a great way to welcome the season. 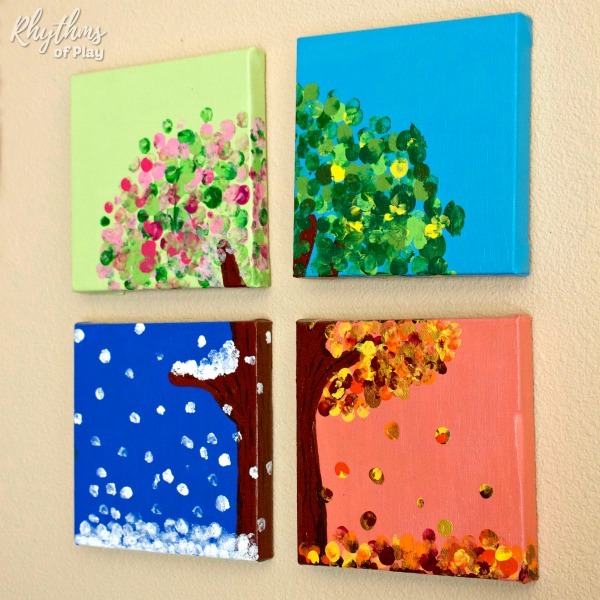 Here are a few summer art and craft ideas to get you started. Make a butterfly tree or some Monarch butterfly peg dolls. Enjoy this awesome collection of Flower art projects. 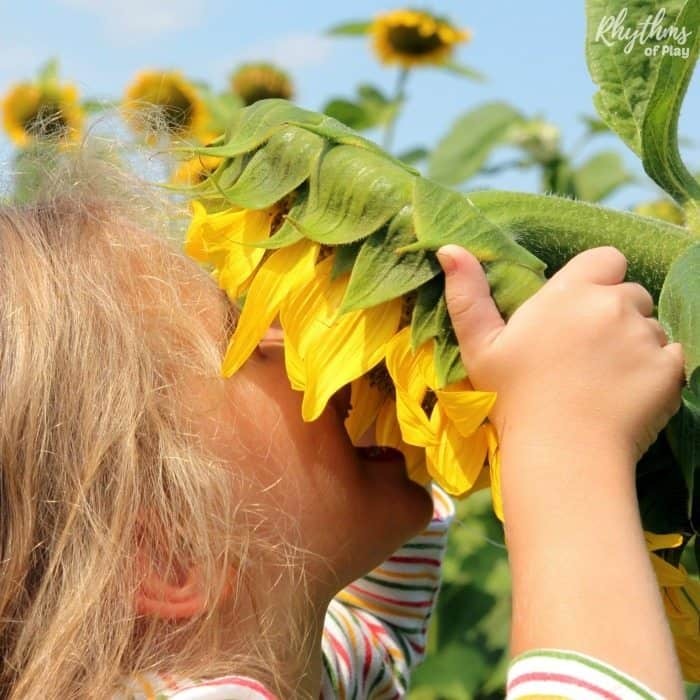 Make shell sunflowers and shell daisies. Decorate your home with summer decor to welcome the season. Some of the seasonal crafts listed above, like a butterfly tree, would be perfect! You can also create your own Summer Nature Table. What better way to celebrate the sun than to eat juicy berries ripened by it? For more information pop over to read take your kids berry picking. Invite friends and family over for a solstice feast filled with seasonal local foods. Visit your local farmers market, or a local farm, to gather all the goodies you need! A bonfire is a great way to celebrate the solstice. Dance, sing, beat drums, play music, and celebrate the official beginning of summer. Please be safe and follow city or county laws and regulations. 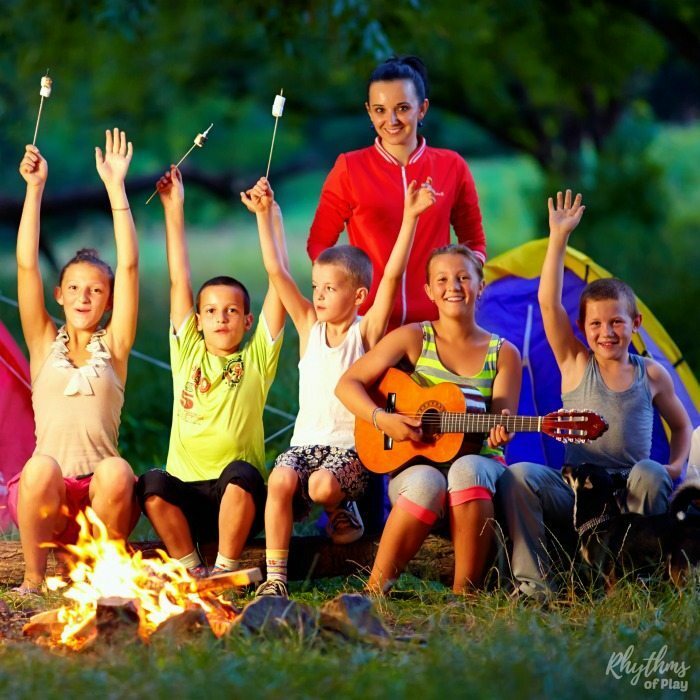 For more information see 10 Tips for a Safe Bonfire with Kids. Did you know that the summer solstice has been named International Day of Yoga by the United Nations General Assembly? That makes this the perfect day to practice yoga! 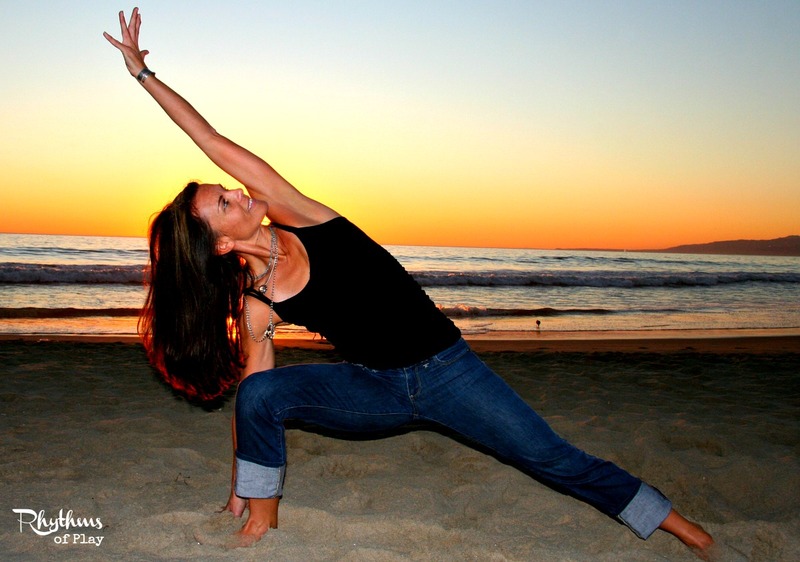 Sun salutations (sun salutes) are a great way to honor the sun on the solstice. You can even attend the summer solstice in time square, where the participants practice yoga sunup to sundown! Not in New York? Participate via webcast. Here I am… practicing yoga on Venice Beach where I worked as an ocean lifeguard for 20 years. The solstices and equinoxes are a great time of year to commit to a quarterly goal review. Having a solstice gathering? Invite your guest to join you in this activity. After doing a goal review write down your intentions. Think of an intention as things, ideas, or habits that you would like to bring into your life. Solstices and equinoxes are a great time to let go of the old and begin fresh. As the temperatures get warmer and people begin to spend more time outdoors it is a great time to begin a new project. Make a list of everything you’ve been wanting to do. Pick your top three choices. Make a plan to start one and go from there. Don’t know where to start? See Creating Positive Habits. Establishing a rhythm will help you get organized and provide a framework for your day. It will help your start fresh this season and find room to manifest your new intentions. Children also thrive on rhythm in the home. Check out How to Plan Your Daily Rhythm for more information. Get outside and connect with what matters on the solstice. You can start with a “signs of summer scavenger hunt.” How many signs can you find that summer has arrived? For more information about Get Outside & Connect click on the link. You might also enjoy this HUGE collection of outdoor activities for kids. There are many ways you can celebrate the summer solstice. 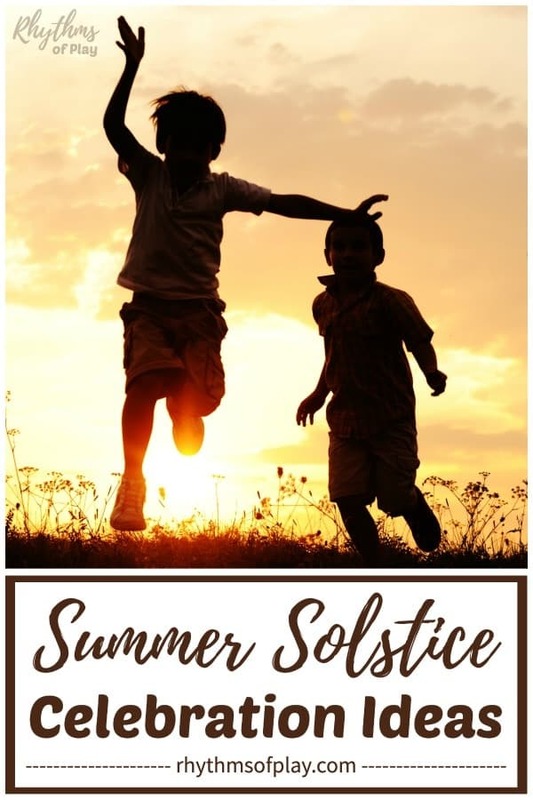 Create a summer solstice celebration that is meaningful for you and your family to celebrate the sun and all it brings to us. Don’t forget to check out our summer bucket list for more fun summer activities to do with kids. 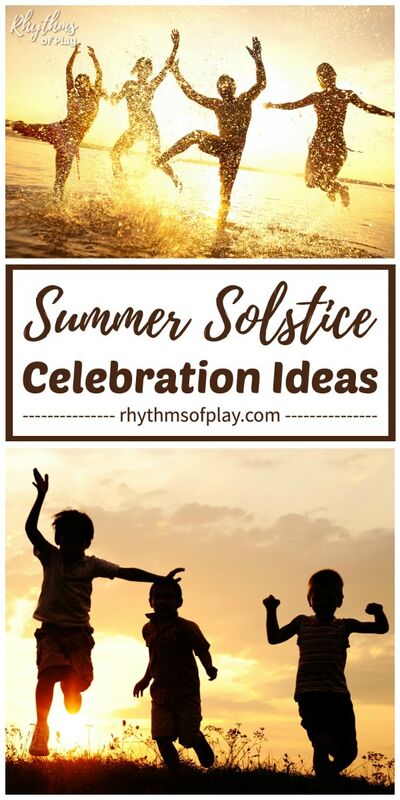 I just discovered Rhythms Of Play and I love those 18 ways to celebrate the Summer Solstice. Nell, you take into account the profound meanings of Summer Solstice celebrations in ancient traditions and integrate them nicely to our modern everyday life. I love the way you dance life! Great article! Great inspirations! Warm thanks! Thank you for the kind words! I’m so glad that you have found inspiration here! Blessings! There are a lot of options, but one we will definitely do is get outside and connect. Mother nature is the best!